Fond of cats? Perhaps you share your home with one (or several)? This is a place where you can share stories of your kitties, ask for advice or tips from other cat friends, or just discuss cats in general. Last edited by Feline on Sat Aug 27, 2005 2:05 am, edited 3 times in total. Hello. I'm new here. I'm a cat lover too. We have a cat called Banjo. (He was our son's cat, and he named him after the game character, Banjo Kazooie). When our son left home, he couldn't take the cat into the rental house, so Banjo stayed with us. Banjo tells my husband to go to bed every night. He starts work early in the morning, so needs to go to bed early. Around 8.30 pm, as my husband rises from his chair to prepare for bed, Banjo is already anticipating his every move. He walks to the doorway which leads to the passageway and sits there, staring intently at my husband. If he takes his time, Banjo starts meowing at him. When he finally heads toward the bedroom, Banjo accompanies him, jumping up onto the bed. He gets his head scratch and stroke, then when my husband gets into bed, the cat jumps off, returns to the living room and curls up in the newly-vacated chair! Occasionally, if I'm sitting up late on a weekend on the computer, Banjo will sit nearby, and meow at me, trying to send me off to bed too! Yea! A brand new guild house! Thanks, Feline! Looks good! Hi all! Just wanted to post here in the new thread. Thanks Feline! One of my fiance's cats tells us to go to bed too! Ashel will meow and/or climb your leg if it's after 10pm. She wants in-bed cuddles! Yeah, my Zayla's the same way. If I'm not home from graveyard shfit by 8:00am, she's waiting at the door for me. She runs douwn the hall to the bedroom going "mew, mew, mew" with each step. Even squirrel -vision outside the window can't compete with bed-snuggles. Wow, new cats' house! Great!!! Sonya will be happy! And so am I. Just wanted to check the new shiny thread.... Thanks, Feline! Darn, feline, I said I would do this right? Oh! A clean littler box- er... Guild thread! Hallo, all! Thanks for the welcome! I've been a cat-lover all my life. I have a photo of me playing with a cat when I was about 2-3 years old. My family always had cats in the house. When I was 17 I got a seal point Siamese. She had a fancy kennel-name, but I called her Cinda (short for Jacinda)! She was beautiful. When I married, just as in my son's case, animals weren't allowed in the rental that we moved into. Cinda stayed with my parents, even moving house with them. About 18 months later we moved into our own home, and not long after that, Cinda came to live with us. She was a part of our family. However she was a little put out the day we brought home a noisy baby! She ran and hid behind the curtains, then poked her head out to see what was causing all the noise! Ah, memories. She's been gone 23 years now, but she'll never be forgotten. Anduril, it's OK. I'll try to be around more often to update. Mrrr, have you seen Fatboy Slim's The Joker? That is awesom!!! Many small kittens in costumes play for people.. Sooooo cute. I just switched on my TV and saw it. Sorry for my prolonged absence from the boards. And I'm very sorry my first post in the new thread has to be such sad news. He would have been 15 years old in July. He wasn't sick or anything, he just seemed to be slowing down some. He stopped sleeping on the bed with me because he could no longer jump up, even though I stacked boxes to sort of make a stairway to help him. One night he seemed to rally some, and I thought he was going to be all right. But he wasn't. He was just saying "Goodbye." He died the next morning at three a.m. while I sat beside him and petted and talked to him. I still have Merlin and Figwit, and I love all my guys, but Bagheera was my baby. I regret now all the times I got angry or impatient with him. All the missed opportunities for petting and cuddling. I wish I could go back and do things different. Sorry can't type anymore. Crying again. It happens everytime I think about Bagheera. Ladykat - I don't know you, but I'm so sorry to hear you've lost your Bagheera. He had a good life - 15 years! At least you were with him, and he knew you loved him. I just received news from a friend of mine that her 4 year old Siamese had to be put down today. He had cancer - a large tumour that grew terribly fast. The family is terribly upset. My Banjo is curled up on the chair beside me, and I keep giving him a scratch, in appreciation that he's here, an important part of our family. LK...... My most heart felt condolences on the loss of your Bagheera. I am quite certain he is in a good place with lots of sunshine and butterflies to chase and soft, warm beds with fluffy pillows to sleep the day away! May his way home be an easy journey. You stay strong as you can. Cry to get the hurt to leave, but remember your baby with much, much love. And know you did not disappoint him. He knew you loved him. to you and your Merlin and Figwit. So, so sorry LK for your loss of Bagheera. It is so hard to lose any beloved pet. Do take comfort in knowing that he was loved and you gave him a good life. I firmly believe in the Rainbow Bridge and being united with our furbabies in the ever after. Give Merlin and Figwit some extra loves to help them through it too. My silly Pookie cat is curled up in my lap, half on the keyboard, "making biscuits" on my leg. Ouch! It makes it difficult to type. I don't know how he keeps those claws so sharp! He's my biggest baby and has to give me kisses each morning for his "Pookie treats" -- which are crunchy cat treats called Temptations. He'll do anything for those treats. He can't go outside because he has asthma and on the rare occasion when he slips past the door and does get out, all I have to do is rattle the bag and he comes right to me. Silly old cat. I don't know what would I do, if Sonya .... I don't want even to think about it. Thank you everyone. It's nice to know that there are people who understand, and don't think grieving for a cat is "silly." And know you did not disappoint him. He knew you loved him. Thank you, Calma and Maeggaladwen for that lovely image. A beautiful, happy place at the end of the Rainbow Bridge. I know he's there, happily playing with Arlo, Mimsy and the others that have gone before him. He had a very sweet and loving nature. LK.... How are you doing? Is it getting better? I hope so. Sharp's hair is starting to come back! We got him something to help it along and it seems to be working. He, of course, has to take every opportunity to show me how much hair he has on his tummy now. He rolls onto his back and waits for me to rub his tummy. He loves that soooo much. He's soooo spoiled, but not as much a my Snow! My little Moria needs to go to the vet soon for her boosters, but now, thanks to regular allergy shots, she's pretty and silky again! I am sitting here listening to the thunder roll over my house. However this is not Snowball's idea of a good time. She just went low rider through the family room and into the pantry and it's dark, dark corner. That's her happy place. Each time a noise like thunder or a jet or some other noise of that ilk happens, she slinks into her happy place until the noise is no more. Sharp, on the other hand is having dinner and a rub down from Dad. He's in his own happy place. Calma - that sounds familiar! Banjo is terrified of thunder, and the sound of rain falling on our colorbond steel carport. It's quite loud, and he clearly doesn't understand what the noise is, so he runs and hides under the bed! The bed is very low to the floor (only about 9 cm), but he's snug, right in the middle and out of reach! When it's all over, out he comes, happy as ever! Oh no, Ladykat... I'm so sorry to hear about your loss. How are you doing now? I don't think it's silly at all to grieve for a cat. Especially for one that has been part of your family for that long. Lk - so sorry to hear about your loss ... big hugs from me. I know when I said goodbye to my Fluffy I was incapable of going to work the next day, I was so grieved. Glad to see the new thread up and running (thanks to Feline) ... promise to stop in more often. All kitties in this household well and happy. Hi... I've not been around much, but I thought I'd pop in & see how everyone is doing! Many ((HUGS)) to LK! So sorry for your loss. Hey to everyone already a friend & hope to get to know the new people as well!! I still have most of my clan: Quarter (sassy & fat), Chalupa (troublemaker), Oreo (battling liver disease... and winning! ), Tuesday (the loner) & Ming (has Iris Bombe... may eventually lose his eye). For those who might remember Mr T, I can't remember if I ever posted this, sorry if I did, but he had FIP & had to be euthanized. It was a hard decision & I've fought with my heart to not adopt a persian... no new additions so far! 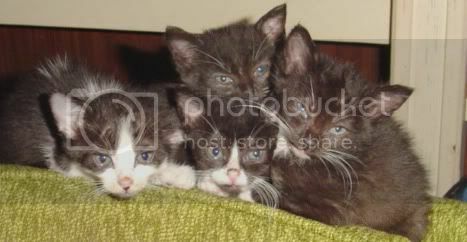 Right now I've still got Babe, the semi-feral foster that no one will adopt & a mom w/ a litter of tuxedo kittens! They're so ADORABLE!! With some help from LOTR fans, their names are: Frodo, Sam, Pippin & Mary! chicki..... Glad to have you stop by and to know all is well with your kitties. I had to chase a cat out of my backyard today. (Sharp was no help, btw.) Anyway the other cat was trying to get the baby squirrel who was eating the food I set out for them and I pelted him with pinecones. I didn't hit him. I just scared the poochies out of him. I didn't want him to hurt the baby squirrel and I don't need any cat fights in my yard. After the cat was gone, I looked at Sharp, who was just sitting there watching me as if to say I did a pretty good job of chasing a cat out of his territory and figured I didn't need his help. Ladykat, I'm sorry to hear of your loss ((HUGS)) and no, it's not silly to cry over a cat. Calma, I liked the story! Just stopping in to say hello to the cats and kittens and to let you know my babies are doing well. Well, as well as two battling pussycats can be. Sharp is looking more and more like a fully furred cat these days. And Snowball survived another rumbling thunderstorm. Cat Story: My aunt has 2 cats, Sasha and Samantha. Samantha will "speak" to me, but only recently has Sasha allowed me to pet her. Anyhow, my aunt has Altzheimers and cannot talk well. I've noticed recently, however, that she can speak full sentences to her cats! Isn't that great? That's great...... Cats are good medicine. I work as a cook in an Altzheimer's facilty. It's good hear there is something that helps your Auntie. Cats are a good thing. Your Auntie is in my thoughts, Iris.